PrestoTex is a 7 mil removable and re-position-able, adhesive-backed, polyester fabric designed primarily for printing interior wall murals. PrestoTex provides a beautiful and durable finish to your graphic and will not peel paint or damage walls. 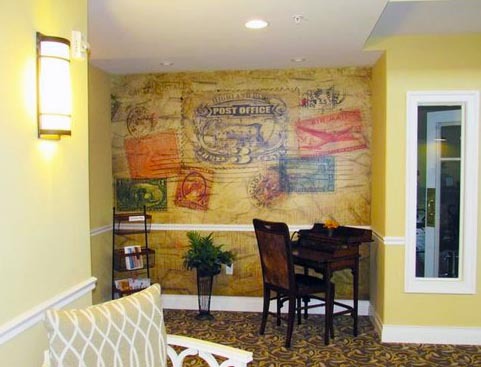 This re-position-able adhesive-backed wall covering has the same easy release micro-sphere adhesive that makes it a favorite of installers across the country. The fabric is moderately translucent, yet more opaque than competitors, which puts it in a class of its own. Wall murals made with PrestoTex capture more attention thanks to the deep color reproduction this material provides and will last for many years. Lamination is not recommend on this product. Looking for a durable and repositionable graphic? Start a project with us today and let us know what you need - we are always happy to be of assistance!